The Vassar College women's volleyball team rallied from two sets down to force a decisive frame against Scranton. 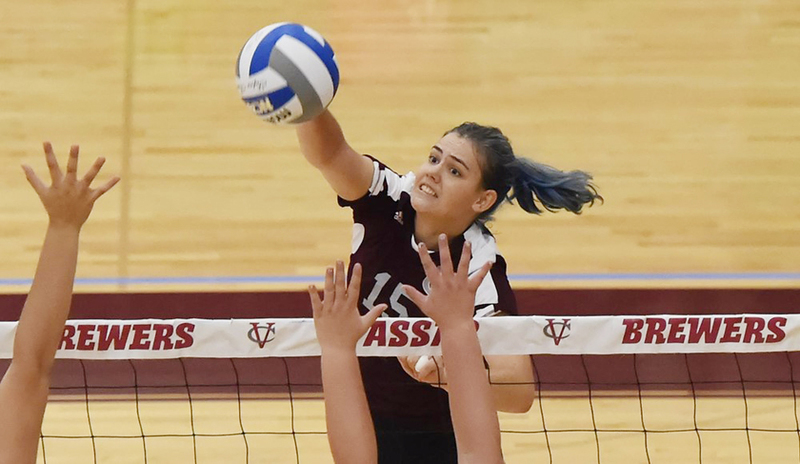 POUGHKEEPSIE – The Vassar College women’s volleyball team rallied from two sets down to force a decisive frame against Scranton at the Athletics & Fitness Center on Saturday afternoon. However, the Brewers (4-4) were unable to complete the comeback, as the Royals (6-3) notched a 25-22, 26-24, 22-25, 17-25, 15-9 triumph in the final match of the Vassar Invitational. Earlier in the day, Vassar fell to Fredonia (4-2) by a 25-18, 25-21, 18-25, 31-29 count. After winning the first two sets, Scranton jumped out to an early 6-1 lead in the third. The Brewers responded with an 11-4 run, though, to open up a 12-10 advantage. The Royals used a 5-0 spurt to reclaim the lead, 15-12, before a Jane McLeod kill ignited an 8-1 Vassar rally that put the Brewers ahead 20-16. Vassar reached set point at 24-20, and Devan Gallagher pounded home a kill to close out a 25-22 win and send the contest into a fourth set. In the fourth set, it was Vassar that built the early cushion, scoring the first three points. Scranton rallied to go up 5-4 before three straight Brewer points gave Vassar back the lead. It was tied at 9-9 when Jennifer Kerbs put one home to start an 8-1 rally that put the Brewers ahead 17-10. Vassar eventually extended that margin to nine points at 23-14, and a McLeod kill finished off a 25-17 victory that guaranteed this match would go the distance. However, Scranton took control of the final set early on, racing out to a 4-1 advantage. After the Royals extended the margin to 10-5, Vassar responded with three of the next four points to pull within 11-8. The Brewers would get no closer, though, as Scranton hit .556 (11 kills, one error, 18 attempts) en route to claiming the final set, 15-9. In total, each team won 105 points across the five sets. Three different Brewers recorded double-doubles in the match, led by Gallagher’s 16-kill, 12-dig effort. McLeod had 15 kills, 19 digs and four blocks, while Annie MacMillan finished with 40 assists and 11 digs. Sara Ehnstrom added nine kills and four service aces, and Jorden Schreeder collected a match-best 28 digs. Vassar posted a team hitting percentage of .182 (53-21-176) in the contest. There were 12 ties and eight lead changes in the first set of the affair. Scranton went up early, 5-2, then Vassar responded to take a 7-6 lead. After the Royals pulled in front 12-9, the Brewers rallied for eight of the next 12 points to go ahead 17-16. Vassar was still holding a one-point lead at 20-19 when Scranton used a 6-2 rally to capture the set, 25-22. Scranton then built a 5-1 cushion in the second set before the Brewers countered with a 6-1 spurt of their own to go up 7-6. The Royals regained the lead at 15-11, but Vassar battled all the way back to tie the score at 23-23 late in the period. After fighting off a set point at 24-23, Scranton earned one of its own at 25-24. Kristin Kirwan put away the opportunity, giving the Royals a 26-24 set win and a 2-0 lead in the match. Kirwan had 20 kills and 15 digs to pace the Royals. Megan Monastra, meanwhile, tallied 13 kills and 19 digs to go along with five aces. Kindler Norman served three aces while also distributing 47 assists for Scranton. Kristin Bush and Regina Schetroma registered 18 kills apiece, and Schetroma added three aces. Scranton hit .159 (55-27-176) as a team. Against Fredonia, Vassar fell behind early before rallying to tie the score at 9-9. The Blue Devils countered with a 12-4 spurt, though, to build a 21-13 advantage. The Brewers scored four of the next five points to cut their deficit to 22-17, but Fredonia took the opening stanza by a 25-18 count. It was Vassar that built an early cushion in the second set, as kills by Gallagher and McLeod put the Brewers in front 5-2. After the Blue Devils used an 11-5 rally to go ahead 13-10, Vassar rattled off four of the next five points to force a 14-14 tie. However, Fredonia responded with a 5-1 run of its own to regain the lead, 19-15. Vassar pulled back within one at 22-21 before the Blue Devils scored the final three points of the frame to close out a 25-21 win. Bolstered by an impressive .302 (15-2-43) hitting performance, the Brewers claimed the third set to extend the match. It was 4-4 early on when Vassar went on a 5-1 spurt to take the lead for good. The Brewers’ cushion reached five points at 18-13, but the Blue Devils countered with four of the next six to pull within 20-17. However, Vassar would end the set by capturing four of the last five points to wrap up a 25-18 triumph. That momentum carried into the fourth set, as the Brewers opened up a 7-3 cushion. After Fredonia went on a 10-5 run to take a 13-12 advantage, Vassar responded with five straight points to go back in front, 17-13. There were a total 12 ties and five lead changes in the set, including a 22-22 deadlock. The Blue Devils won the next two points to reach match point, but Vassar took the next three to earn a set point of its own. Fredonia evened the score at 25-25, then had four more match point opportunities. Vassar evened the score each time before the Blue Devils finally converted on their seventh chance, 31-29. Gallagher and McLeod both notched double-doubles against the Blue Devils, as well. Gallagher posted 17 kills and 11 digs, while McLeod tallied 10 kills and 13 digs. MacMillan handed out 33 assists, and Schreeder finished with 29 digs, giving her 57 total on the day. As a team, the Brewers hit .179 (43-17-145) in the match. Kailey Falk had 13 kills, 13 digs and four blocks for Fredonia. SallyAnne Rudney also recorded a double-double with 11 kills and 12 digs, while Brinn Shaughnessy and Emily Jones slammed 10 kills apiece. Amanda Mosack distributed 46 assists to go along with six digs, and Rachel Aiello returned 26 digs for the Blue Devils. Fredonia posted a team hitting percentage of .188 (53-24-154). On Wednesday, the Brewers return to action with a 6 p.m. matchup at Williams (4-0).